All the Right Notes joins the Burgess Hill Town Festival! All the Right Notes are delighted to announce that they will be performing as part of the Burgess Hill Town Festival this year. 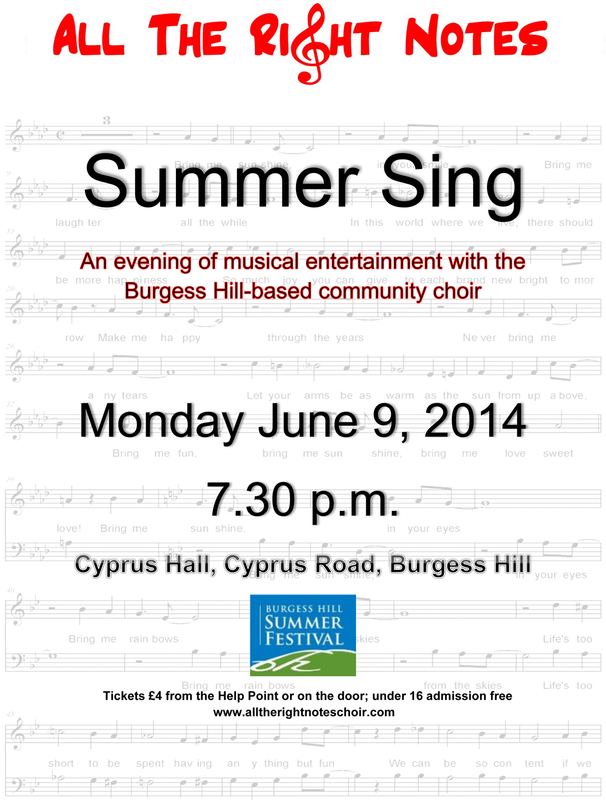 The concert will be held at the Cyprus Hall in Cyprus Road, Burgess Hill, on Monday June 9th 2014, at 7.30 p.m.
Tickets are price £4 and are available at the Help Point or can be bought on the door. Children 16 and under (Year 11 and below) can come in free. Refreshments will be on sale during the interval. 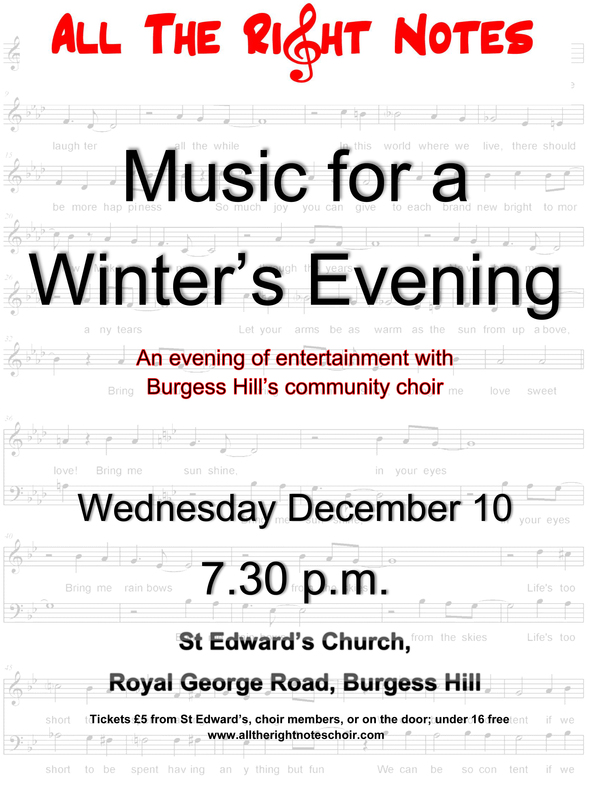 The programme will include some items for the audience to join in, as well as some readings and solo pieces by members of the choir. Author PSPosted on May 4, 2014 May 6, 2014 Leave a comment on All the Right Notes joins the Burgess Hill Town Festival! As most people know, we are no longer using the Royal British Legion for rehearsals. This week (Wednesday 24th April) and Wednesday June 5th, we will be at what we hope will become our new base of operations: Cherry Tree Centre, Fairfield Road, Burgess Hill, RH15 8QB. All other weeks will be at the Burgess Hill Theatre Club, opposite the Post Office in Church Walk. Members will receive details regarding parking etc. at Cherry Tree Centre by email. Author PSPosted on April 19, 2013 Leave a comment on We’re on the move! Thanks to everyone for their hard work at the Spring Sing this evening at the Burgess Hill Theatre Club – please send photos across so we can put them up. The evening raised £30 for charity. All the Right Notes Spring Sing! As it’s a short term, we’re not putting on a full concert, but we hope families and friends will join us for our Spring Sing on Wednesday March 20th at 8 p.m. at the Burgess Hill Theatre Club. A very varied programme will include some old favourites, as well as new arrangements of songs especially created for the choir. Admission is free and refreshments will be provided afterwards. Author PSPosted on March 6, 2013 March 6, 2013 Leave a comment on All the Right Notes Spring Sing! There will be a practice as usual for All the Right Notes this coming Wednesday, 30th January, at the Royal British Legion in Cyprus Road. 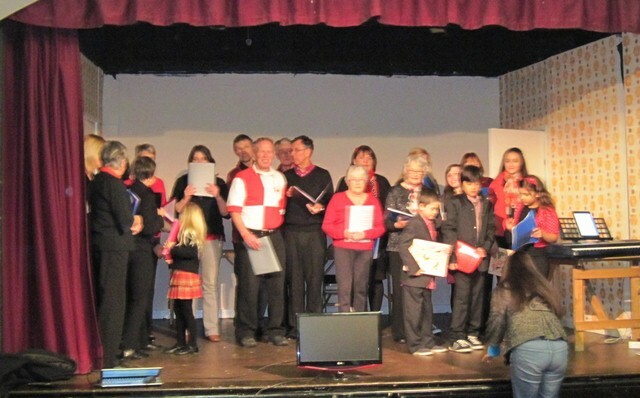 All the Right Notes has finished now for 2012, but we will be returning in January 2013 with two taster sessions on Wednesday January 9th and Wednesday January 16th, from 7.45 to 9.15 p.m. at the Royal British Legion Hall in Cyprus Road, Burgess Hill. Our pre-Christmas events were a success – the pictures are on the Christmas 2012 page. Please do send any others you have across and we will put them up.